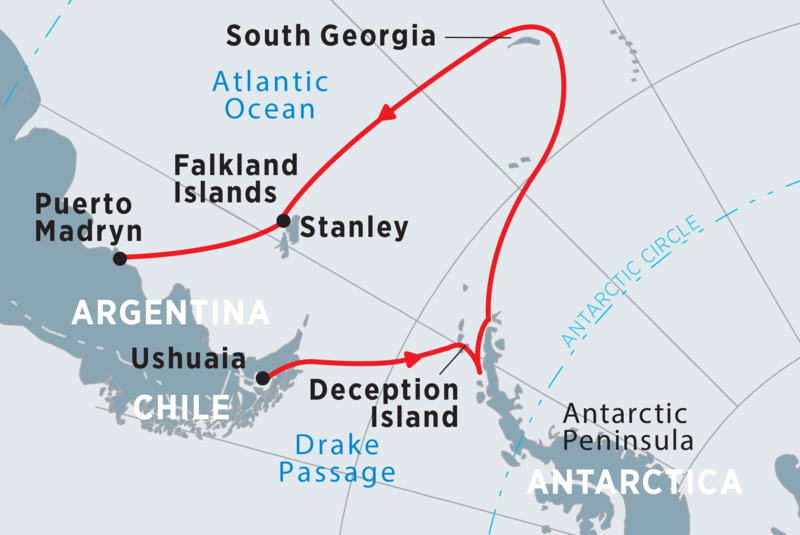 Set sail from Ushuaia on the Ocean Atlantic on this extensive 20 day trip that takes in a crossing of the Drake Passage, the Antarctic Peninsula, the Falkland Islands and South Georgia. Savour close-up encounters with the region’s incredible wildlife – penguins, whales, and seabirds – follow in the footsteps of legendary explorers like Shackleton, and discover the history and stories buried beneath the ice. Enjoy Zodiac excursions to cruise through ice-filled bays, stop at penguin breeding grounds and land at iconic sights. While at sea take advantage of your ship’s warm hospitality, comfortable living quarters, and onboard experts, with ample leisure time to absorb your unique surroundings. This Antarctic adventure provides the perfect way to discover one of the last frontiers for explorers.